When the sun comes out, so do our feet! After keeping them cocooned in thick socks and shoes during the colder months, we all enjoy slipping our feet into sandals and stepping outside, ready for summer fun. Unfortunately, wearing new, often-unsupportive footwear and spending more time outdoors can make foot ailments and injuries more likely to occur. To help you avoid foot issues at this time of year, we’ve put together the following foot health tips. With care and attention, your feet can stay healthy all summer long. 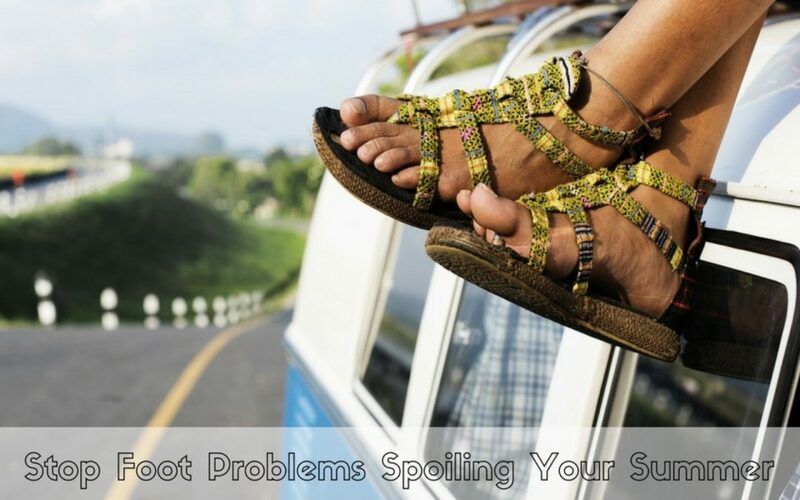 The importance of using sun cream to guard against sun damage and skin cancer is widely known, but people often overlook their feet when applying it. Next time you’re rubbing in some Factor 30, remember to include your feet, even the soles. If the sun does catch you out leaving you with sunburned feet, aloe vera gel can provide relief. In humid weather, fluid accumulates in your tissues, which can lead to uncomfortably swollen feet. Good-quality leather sandals or covered-in shoes with ventilation panels will help your feet to stay cool and comfortable. You can also keep the swelling at bay by taking regular exercise, not standing for long periods and cutting out high-salt foods from your diet. Flip-flops and thin-soled sandals fail to provide sufficient shock-absorption. They’re shortcuts to painful arches, which require rest, elevation and cold compresses. Choose sturdy, well-cushioned sandals instead. What’s more, to make your footwear more supportive and relieve pain, you can ask a podiatrist for custom-made orthotics. Sharp objects such as grit, broken glass and seashell fragments can cut feet. Never go barefoot in an unfamiliar area (or anywhere, if you have diabetes-related nerve damage), and be mindful of where you’re treading. Cuts and scrapes act like magnets for harmful bacteria, so it’s vital to clean, dry and dress them (the NHS offers wound care advice). If a wound is deep, doesn’t heal quickly or becomes inflamed, seek medical help. Your feet will inevitably sweat more when temperatures are high, so it’s particularly important that you wash and dry them thoroughly every day in summer. If you experience foot odour, an antibacterial soap (Hibiscrub is a common choice) can work wonders. If you have any discoloured toenails and are reluctant to put your feet on display, now is the time to tackle the problem. Yellowish, brittle nails may be suffering from a fungal infection. Thankfully, podiatrists provide effective fungal nail treatment. New sandals often feel stiff and unforgiving, and the friction feet are exposed to when walking around in them often causes blisters. That’s why it’s a good idea to ‘break in’ your summer footwear by wearing it with socks at home before venturing outside. Another tip is to apply anti-chafing gel to your feet for a protective barrier. If you do develop a blister, cover it with a plaster and apply antiseptic if it bursts. Swimming pools are particularly popular in the summer but can pose risks to feet. Two of the most frustrating foot problems – athlete’s foot and verrucae – are spread via contact with contaminated skin, objects and surfaces. To help protect your feet, invest in a pair of pool shoes, avoid sharing towels and don’t wander around changing rooms barefoot. Whatever your plans for the summer, you’ll enjoy yourself more if your feet are in tip-top condition. Our experienced podiatrists provide a comprehensive range of foot care services. Why not book a foot health check at one of our London clinics? For expert foot care this summer and beyond, please call Feet By Pody today on 0207 099 6657 or book your appointment online.